I am not a big drinker, but I do like a little something when I am having dinner with friends on the weekends. I am partial to a class of red wine or rosé, and occasionally I love a fun cocktail. My husband and I like different kinds of drinks, but one we agree on is a Moscow Mule, especially in the summer. Have you had one? It’s a very refreshing drink made from vodka, spicy ginger beer (which is not beer at all, but similar to ginger ale,) and lime juice, and served in a copper mug. So good! Many years ago (and I mean MANY) I remember the cover of Bon Appetit featured several bright-colored cocktail popsicles. I thought that was the most genius thing ever and I swear I have been thinking about doing that for the last 15 years! 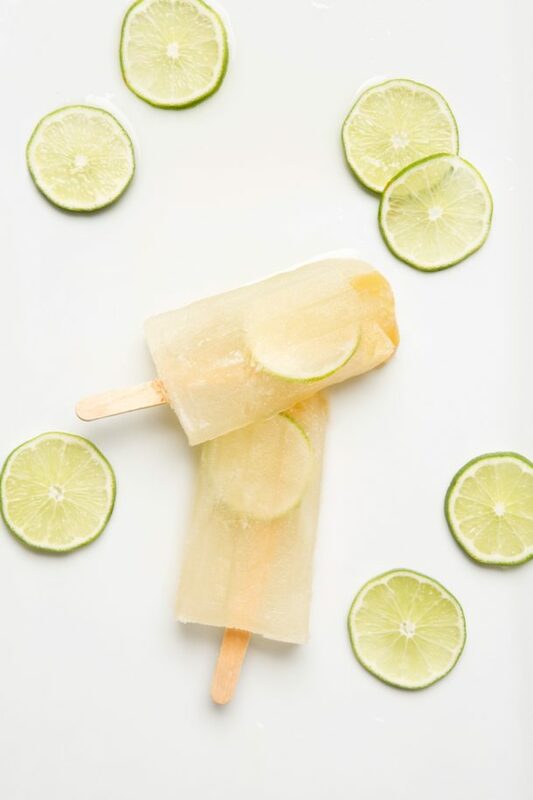 So I decided to take my new favorite cocktail, the Moscow Mule, and freeze it into a popsicle. Great idea, right? Wrong! Whoops! Alcohol doesn’t freeze, so I ended it up with a slushy mess in my popsicle molds. I actually pulled the stick out and nothing was attached! After doing a little research, I figured out the maximum amount of alcohol, i.e. vodka, that could go into a single popsicle that would freeze and not turn into a puddle is only 1 teaspoon. It’s not exactly enough booze to get buzzed, but I assure you this popsicle still tastes like a Moscow Mule on a stick. In this batch I also added some crystallized ginger to the mixture, but it all sank to the top of the popsicle. Not a bad thing, but it didn’t get distributed the way I wanted it to. This was photographed on a hot day, so they melted quickly, but I promised with only 1 teaspoon of vodka, these will freeze. My friends all loved them and it was a very fun way to get the evening started. I know these aren’t the typical super healthy fare I like to post here, but indulging every now and then is fun and that’s my reality. Make these for your next get-together and your friends will love them! 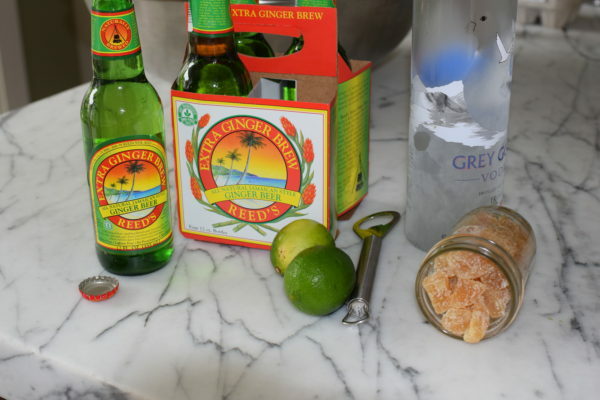 Place the ginger beer in a large liquid measuring cup or a bowl with a spot (anything larger than 6 cups will do). Add the lime zest and juice and stir until combined. 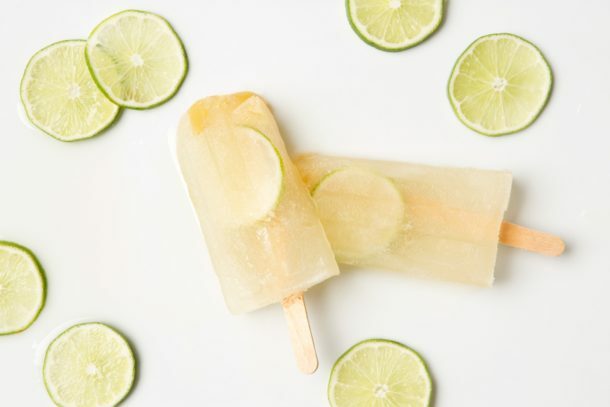 Pour 1 teaspoon of vodka into each popsicle mold. Fill up the rest of the molds with the ginger beer/lime mixture. Stir each one well with a popsicle stick. 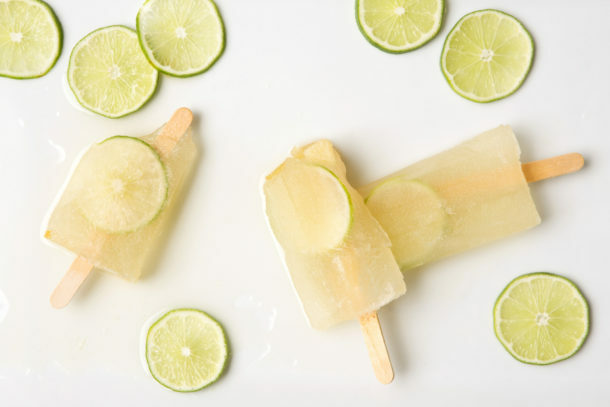 If desired, place a lime slice into each mold and place popsicle stick into center. Place into freezer until completely solid (about 3 hours). ** If you add more vodka to make these more alcoholic, they will not freeze completely solid. I’m not a big drinker either, but I love Moscow mules. I recently had a drink that had tequila, ginger, orange juice, I think pineapple juice and cilantro. It was so refreshing and a hint of the cilantro was yummy. Wonder how that would be as a Popsicle. I think it sounds amazing. Make the drink without the tequila, fill the molds and stir in 1 tsp of tequila into each mold. Let me know how it turns out!